Warren Buffett may hate it, but gold is shining brighter than ever as central bank stimulus efforts drive investors into the traditional safe haven asset. According to analysts, the precious metal may test its 1980 all-time high in real terms of US$2,300 an ounce, aided by geopolitical tensions in Asia and the Middle East. Gold prices are expected to enjoy their biggest quarterly gain since June 2010 this quarter, after the U.S. Federal Reserve launched its third round of quantitative easing, including buying U.S. $40 billion a month of mortgage-backed securities. In the past four months, the yellow metal has gained 13 percent to U.S. $1,764 an ounce, but prices may reach U.S. $2,000 an ounce within months and U.S. $3,000 an ounce by early 2014, according to Bank of America Merrill Lynch. However, the predicted price rise is unlikely to tempt U.S. billionaire Buffett into an investment. According to Buffett, gold bugs are akin to a cult seeking to defend its mystique. “You can knock almost any investment and nothing happens. But when you talk about gold it’s different. Of course that says something about their motivation for ownership. They want people to agree with them. They want everybody to get so scared they run to a cave with gold,” he said. Raymond Dalio, founder of the world’s biggest hedge fund, Bridgewater Associates, has argued that the Oracle of Omaha is making the wrong call on gold. “Gold should be a part of everybody’s portfolio to some degree because it diversifies the portfolio,” Dalio told CNBC in September. While inflation is currently tame among developed economies, any surge in asset prices would benefit gold, which is traditionally valued as a hedge against inflation. U.S. monetary expansion traditionally results in rising gold prices, with a depreciating dollar also seen as another reason to invest in gold as protection. Demand for gold and gold jewellery from developing countries has also increased in recent years, at the same time as central banks and retail investors have boosted purchases. World central banks became net gold buyers in 2010 after decades of net sales, with the world’s official sector currently holding around 17 percent of the global above-ground stock compared to 19 percent owned by investors and nearly half made of jewelry. A gap between gold stock valuations and prices has spurred a wave of takeover activity in the sector, including Canadian miner B2Gold’s $1.1 billion bid for CGA Mining and Australian gold producer St. Barbara’s A$556 million acquisition of Allied Gold. However, the higher prices have not prevented gold miners making cutbacks to reduce costs: U.S. giant Newmont Mining recently axed 70 jobs across sites in Australia and New Zealand following a cost review. Demand for gold may also increase from a somewhat unexpected source, with calls from some U.S. Republicans for the country to establish of a “gold commission” to consider restoring the link between the dollar and gold. However, according to Capital Economics, a return to the gold standard would cause gold prices to reach US$10,000 an ounce, damage the dollar’s credibility and risk a new trade war. Gold bulls may be hoping for a Democrat victory in the presidential poll, with one analyst saying that U.S. President Barack Obama’s re-election would be a positive for gold prices. 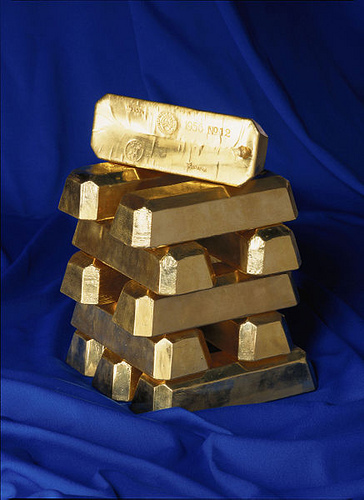 “Obama’s re-election will see deficits continue, which will be positive for gold. It will put continued pressure on [U.S. Fed chairman Ben] Bernanke and continue to keep pumping up the system,” commodity strategist Don Coxe told the Denver Gold Forum in September. At the same forum, gold bull Pierre Lassonde, chairman of Franco Nevada Corporation, predicted gold could reach US$13,000 an ounce over the next decade. Regardless of whether his prediction proves accurate, most analysts expect gold to enjoy higher prices until the threat of rising inflation fades.